Every Friday we're pleased to offer Legacy Family Tree Webinar subscribers a new bonus webinar just for them! This Friday enjoy "Burials and Burial Grounds of England and Wales" by Kirsty Gray. If you're not a member, remember the webinar previews are always free. Churchyards are one of the nation’s priceless and unique heritages – a light-hearted review of our forebears’ commemorations, and how to locate and explore these storehouses of history. Kirsty is a professional genealogist and Heir Hunter who runs her own research company Family Wise Limited. As a freelance author, she has published articles in family, local and social history magazines and handbooks across the globe. She has been researching the story of her paternal West Country family for many years and, having realised in the late 1990s that her eccentric hobby was called a surname study, co-founded The Surname Society (registering the Sillifant surname) in 2014 to meet the needs of surname studiers in the 21st century. In 2011, Kirsty took over from Penny Christensen as Director of English Studies for the National Institute for Genealogical Studies, updating previous courses and expanding the provision for online genealogical research courses about English records. Having published Tracing Your West Country Ancestors in 2013, Kirsty is now working on Tracing Your Industrial Ancestors with Pen and Sword Books and is a founder member and was initially Chair (now Secretary) of the Society for One-Place Studies, an international society for family and local historians. Although a relative youngster in the field of genealogy, Kirsty has been involved in family history for almost two decades and has lectured on various stages from local to international. Having traded in her day job as a teacher to follow her passion, Kirsty is widely sought after as a family history tutor, lecturer and motivational speaker in the UK. The recording of today's webinar "Texas Genealogy: Online Research in the Lone Star State" by Deena Coutant is now available to view at www.FamilyTreeWebinars.com for free for a limited time. An introductory look at the records and repositories for getting started in Texas Research. If you could not make it to the live event or just want to watch it again, the 1 hour 32 minute recording of "Texas Genealogy: Online Research in the Lone Star State" is now available to view in our webinar library for free for a limited time. Or watch it at your convenience with an annual or monthly webinar membership. Sweden's Multiple Naming Systems and How They Changed in the 1800s by Martha Garrett, CG. October 6. Past Conflict Repatriation: The Role of Genealogists and Methodology in Fulfilling Our Nation’s Promise by Jeanne Bloom, CG. October 6. Reasonably Exhaustive Research of African American Families That Came Out of Slavery by LaBrenda Garrett-Nelson, JD, LLM, CG. October 6. Using Timelines for Correlation and Analysis by Jill Morelli, CG. October 6. Land, Licenses, Love Gone Wrong, and Other Assorted Courthouse Records by Ann Staley, CG, CGL. October 6. 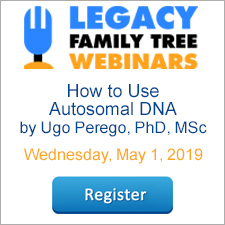 Systematically Using Autosomal DNA Test Results to Help Break Through Genealogical Brick Walls by Tom Jones, Ph.D, CG, CGL. October 6. Filling in the In-Between of the Jewish BMD by Rose Feldman. October 29. Introduction to the Use of Autosomal DNA Testing by Tim Janzen. October 29. Google for Genealogy: Search Tricks to Tease Out Information by Jessica Taylor. October 29. Discover Your Family History with MyHeritage's Unique Technologies by Daniel Horowitz. October 29. How to Pass Your Ancestors' Legacy to Your Grandchildren by Jessica Taylor. October 29. Advanced Autosomal DNA Techniques used in Genetic Genealogy by Tim Janzen. October 29. Jewish Family Research Challenges by Garri Regev. October 29. An Ahnentafel Report is a condensed report that includes everyone’s Ahnentafel number and their vital events (birth, marriage, death, burial). The Ahnentafel number is based on their location in your direct line pedigree. You are always #1, your father is #2, your mother is #3, your paternal grandfather is #4, your paternal grandmother is #5, your maternal grandfather is #6, your maternal grandmother is #7, and then the pattern continues. The mathematical formula in play is that a person’s father is double their number and the person’s mother is double plus 1. These numbers are based on the anchor person for the report. Most people use themselves as the anchor but if you use someone else be aware that the Ahnentafel numbers you see relates to them and not to you. You can use the formula on anyone that appears in the report. For example, in my Ahnentafel Mathew Robert Patton is #44. His father will be #88 and his mother will be #89. To create this report all you need to do is open the Ancestor Book Report (Reports > Ancestor Book) and choose your anchor person (usually you). Set it for ALL GENERATIONS. UNcheck the boxes for a Table of Contents, Indexes, and a Title Page. You can of course keep these but I prefer to make this report as concise and compact as possible. On the PAGE LAYOUT tab make sure that "Start new page after each generation" is NOT checked. I also like to check the box to "Print names in bold." Now click the REPORT OPTIONS button. On the INCLUDE tab UNcheck every box. On the FORMAT tab the only box that should be checked is the “Remove one or more leading commas from locations” OR “Use short location names” (my preference). On the NOTES/STORIES tab leave everything UNchecked. On the SOURCES tab leave everything UNchecked. You can include sources if you wish but again, you want this report to be short, to the point, and easy to read. On the PICTURES tab leave everything UNchecked. Now Preview the report. I love this report! All of your levels of grandparents are grouped together. Here is a snippet from my personal file. I hope you find this report as useful as I have. Michele Simmons Lewis, CG is part of the Legacy Family Tree team at MyHeritage. She handles the enhancement suggestions that come in from our users as well as writing for Legacy News. You can usually find her hanging out on the Legacy User Group Facebook page answering questions and posting tips. Certified Genealogist is a registered trademark and the designation CG is a service mark of the Board for Certification of Genealogists®, used under license by Board certificants who meet competency standards. Join us and Deena Coutant for the live webinar Wednesday, September 27, 2017 at 2pm Eastern U.S. Register today to reserve your virtual seat. Registration is free but space is limited to the first 1,000 people to join that day. Before joining, please visit www.java.com to ensure you have the latest version of Java which our webinar software requires. When you join, if you receive a message that the webinar is full, you know we've reached the 1,000 limit, so we invite you to view the recording which should be published to the webinar archives within an hour or two of the event's conclusion. Deena Coutant is passionate about creating family legacies that connect the past, present and future generations, through stories, photos or by uncovering the DNA of those ancestors who were previously lost to history. As a full-time professional researcher, genetic genealogist and photo organizer, she provides strategies to help her clients successfully discover, celebrate, share and properly preserve their families’ memories, leveraging modern technology to bring them from the obsolescence of the past into the digital age. Deena offers a unique blend of preservation services through her company, DigiDeena Family Heritage Solutions. Every Friday we're pleased to offer Legacy Family Tree Webinar subscribers a new bonus webinar just for them! This Friday enjoy "Ahead of the Times: Texas Newspapers" by Cari Taplin, CG. If you're not a member, remember the webinar previews are always free. Newspapers were daily snapshots of our ancestor’s lives. Texas newspapers are no exception. Examine the broad spectrum and history of Texas newspapers for genealogical research. Methods, techniques, and strategies for obtaining those items of interest will be demonstrated. Tomorrow we leave to begin our 14th annual Legacy Genealogy Cruise, this year to the Pacific Coast cities of Astoria, San Francisco, and Victoria, British Columbia. We will sail on Royal Caribbean’s luxurious Explorer Of The Seas. I'll let you know all about it, either here on our blog, or over on our Facebook page (or both). You can also follow the ship online. Always know where the Explorer of the Seas is here. Our 7th anniversary webinar celebration will continue while we're away. Look for the 15 most-requested members-only webinars here. They're free through October 15. It's good for 10% off anything at www.LegacyFamilyTreeStore.comor www.FamilyTreeWebinars.com through Saturday, September 30, 2017. Our sincere thanks go out to our entire technical support and sales staff who will continue to provide sales and support services while we are away. Thanks Ron, Michele, Sarah, Marian, Jairmie, John, Debbie and Leonard for keeping us afloat! The recording of today's webinar "WolframAlpha for Genealogists" by Thomas MacEntee is now available to view at www.FamilyTreeWebinars.com for free for a limited time. Wolfram Alpha provides solutions to questions such as “How am I related to my great-grandmother’s niece” or “What was the time of the sunrise on April 1, 1962, in Chicago, Illinois?” Learn how this unique site can expand your genealogy and family history research. If you could not make it to the live event or just want to watch it again, the 1 hour 19 minute recording of "WolframAlpha for Genealogists" is now available to view in our webinar library for free for a limited time. Or watch it at your convenience with an annual or monthly webinar membership. The recording of tonight's webinar by the Board for Certification of Genealogists, "When Does Newfound Evidence Overturn a Proved Conclusion?" 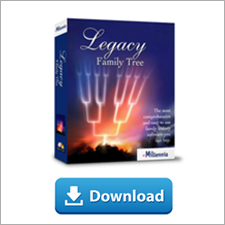 by Tom Jones, PhD, CG, CGL is now available to view at www.FamilyTreeWebinars.com/BCG for free for a limited time. Even thorough research can miss relevant sources. What are the options when useful information or DNA test results appear after a researcher establishes a conclusion? If you could not make it to the live event or just want to watch it again, the 1 hour 19 minute recording of "When Does Newfound Evidence Overturn a Proved Conclusion?" is now available to view in our webinar library for free for a limited time. Or watch it at your convenience with an annual or monthly webinar membership. I was entering information from a death certificate into Legacy when I ran into a problem. The death certificate stated that the deceased was born in Salley, South Carolina in 1845. I knew that Salley was in Aiken County but when I tried to enter Salley, Aiken, South Carolina, United States into Legacy I received a warning message. I got this warning because I have the US County Verifier turned on in Options > Customize > Data Entry > Option 2.1. This lets me know when I have entered a county that didn't exist at the time of my event. I clicked the Online County Info button which brought me to the Aiken County, South Carolina FamilySearch Wiki Page. There I found, “10 March 1871: Aiken was created from Barnwell, Edgefield, Lexington and Orangeburg Counties.” So the question is, which of these four counties was Salley in in 1845? This is where AniMap can help. Many Legacy users already have AniMap and use it in their research so I wanted to show you how Legacy and AniMap can work together. AniMap allows me to pinpoint a specific location and then I can see how the state and county boundaries changed around that location over time. I chose 1832 because that is the date of the last boundary changes prior to 1845. Salley was in Orangeburg County in 1845. Now I can enter the correct information into Legacy. You always want to record your location as it was at the time of the event. Not all boundary changes are this complex. If I had entered Forrest County, Mississippi, Legacy would have told me that Forrest County was formed from Perry County in 1906. In this case I would already have my answer and wouldn't need to go any further. Geoff gives an overview of AniMap, Centennia, and Map My Family Tree in Mapping Software for Genealogists. He also demonstrates how the US County Verifier works. In this webinar you will see that Geoff is using Legacy 7.4. In Legacy 8 and 9 the US County Verifier warning screen now has two more buttons giving you even more information to work with. You will also learn how to run a County Verifier Report that will check your entire file for these warnings. In Legacy 8 and 9 you can access this report by going to Tools > US County Verifier. In the drop down box choose USA County Verification. AniMap is owned by Gold Bug and you can read more about it here. Join us and Thomas MacEntee for the live webinar Wednesday, September 20, 2017 at 2pm Eastern U.S. Register today to reserve your virtual seat. Registration is free but space is limited to the first 1,000 people to join that day. Before joining, please visit www.java.com to ensure you have the latest version of Java which our webinar software requires. When you join, if you receive a message that the webinar is full, you know we've reached the 1,000 limit, so we invite you to view the recording which should be published to the webinar archives within an hour or two of the event's conclusion. What happens when a "tech guy" with a love for history gets laid off during The Great Recession of 2008? You get Thomas MacEntee, a genealogy professional who's also a blogger, educator, author, social media connector, online community builder and more. Thomas was laid off after a 25-year career in the information technology field, so he started his own genealogy-related business called High Definition Genealogy. He also created an online community of over 3,000 family history bloggers known as GeneaBloggers. His most recent endeavor, Hack Genealogy, is an attempt to "re-purpose today's technology for tomorrow's genealogy."